Books serve many different purposes. They give us a fun escape from the demands of daily life. They give us a glimpse into a time from long, long, ago. And often, they give voice to our thoughts as the author so eloquently puts words to what may be going on in our lives. Young Jackson and his family are having big problems. Dad is ill and unable to work regularly, and Mom pieces together part-time jobs to make ends meet. But it isn’t enough. Jackson and his little sister, Rosie, go to bed hungry more often than not. And when a yard sale that includes all of their belongings doesn’t even bring in enough to cover next month’s rent, they find themselves on the verge of being homeless once again. Just when Jackson thinks his life can’t get any worse, his imaginary friend, Crenshaw, makes a reappearance. And just as when he was younger, Crenshaw is there to help him make sense of things. Just as she did in “The One and Only Ivan”, Katherine Applegate brings to life the magical world described on the pages. Her descriptions of Crenshaw’s antics are spot-on as any cat owner will recognize. The innocent denial of Jackson and Robin is truly childlike. As it should be. And her underlying message of friendship is timeless as well as ageless. Friendship is what pulls us through, gives us hope when things aren’t going so well. Who cares if that friendship comes in the form of an imaginary human-size cat? Yes, this is more of a children’s book than a book that is truly meant for adults. But aren’t we all children at heart? I mean, how many of us read ALL of the Harry Potter books? Multiple times? 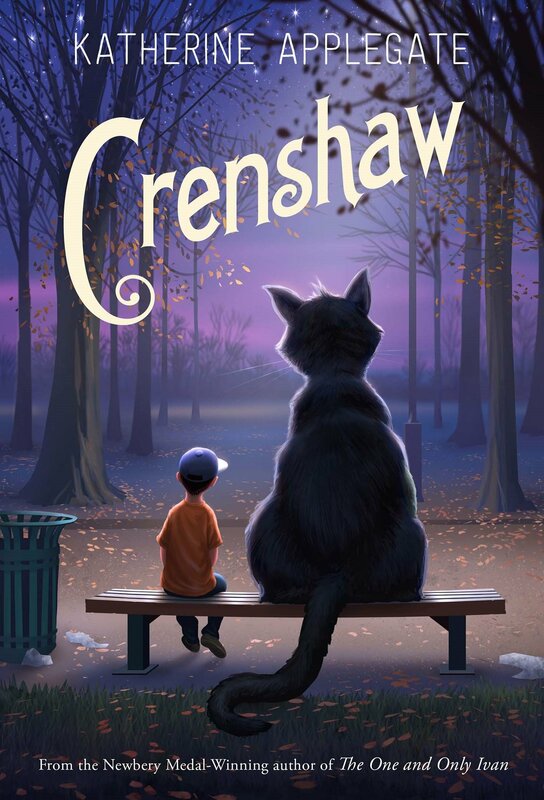 Crenshaw is a story that can be enjoyed by readers of all ages. Read it by yourself, read it to a special young person in your life, just read it.